Real estate securities provide the ability to construct a broadly diversified, liquid real estate portfolio with relatively little capital. Investors can implement an allocation that accesses the broad real estate market, including both landlords and developers, or one that focuses on rental businesses. While these approaches share much in common, there are subtle differences in investment characteristics that may appeal to different investor constituencies. Rental-only strategies invest in companies with relatively predictable cash flows tied to long-term property holdings. Broad-market real estate strategies consist largely of rental securities, but may also own real estate developers, which tend to be more cyclical (and therefore may at times be more volatile), providing access to potentially attractive opportunities that rentalonly strategies may exclude. Real estate securities are an expanding segment of the global equity market. Indeed, in recognition of this fact, Standard & Poor’s and MSCI recently realigned the Global Industry Classification Standard (GICS), elevating real estate to its own distinct sector category, separate from financials. Real estate securities can offer an efficient means of investing in commercial properties, with access to an array of property types and geographic regions. Securities are issued primarily by two types of companies—landlords and developers—each with unique and compelling characteristics. Landlords own and operate commercial properties that typically generate a predictable stream of recurring revenue from rent payments. This highly visible cash flow results in relatively lower volatility for the companies compared with developers. The majority of publicly traded property owners are structured as real estate investment trusts (REITs), a unique corporate structure that provides a tax-efficient means of distributing rental income to shareholders. Developers generally focus on property development, although they may derive a portion of their income from rents as well. Developers tend to be more cyclical due to the transaction-based nature of their business model—which includes the ongoing process of acquiring land, building and then selling properties. Developers take on more market risk than property owners, but also have the potential to reap greater rewards during cyclical upturns. While there are pure plays in each category, companies are often engaged in both ownership and development to some degree. The prime retail sector in Europe, for instance, is dominated by income-focused companies that also develop properties. Likewise, developers in Hong Kong and Japan typically retain high-quality properties on their balance sheets. By focusing on the different types of companies, investors can target particular risk-return parameters. Rental companies tend to focus on predictable cash flows and, longer-term, recurring cash flow growth per share. Developers are typically more focused on shorter term net asset value (NAV) creation from developments. 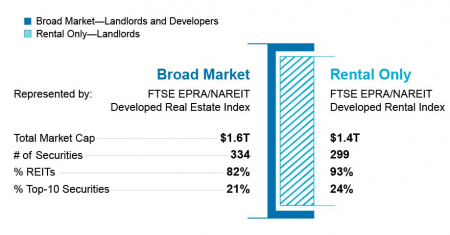 To gauge the differences between securities issued by landlords and developers, we focus on two indexes: the FTSE EPRA/NAREIT Developed Real Estate Index (Broad Market Index), which reflects the entire real estate securities universe, and a “rental only” subset, the FTSE EPRA/NAREIT Developed Rental Index (Rental Index), which excludes developers and companies that derive a meaningful portion of their revenue from non-rental activities. For inclusion in the Rental Index, a company’s rental revenue from investment properties must be at least 70% of total revenue. So while the Rental Index is primarily composed of landlords, many of the companies frequently engage in some development as well. At June 30, 2016. Source: Cohen & Steers. The Broad Market Index generally has greater exposure to Asia-Pacific countries due to the region’s greater proportion of real estate development companies. By contrast, the Rental Index generally has greater exposure to the U.S., where the vast majority of the universe consists of landlords. Geography can play an important role when investing in real estate securities, because at any given time, property markets in a region or country offer varying levels of risk and reward potential stemming from differences in their property cycles, macroeconomic conditions and monetary policies. At the sector level, the Rental Index has larger allocations in the retail and apartment markets. The Broad Market Index, with its inclusion of firms engaged in property development, has a greater concentration in companies with diversified operations across multiple sectors. Sector returns can vary widely in a particular economic environment due to distinct characteristics of each property type, including lease duration, barriers to supply and specific economic drivers that affect the property’s tenants. Lease duration, for instance, is measured in days for hotels, months for self storage properties and years for office, industrial and healthcare landlords, affecting how quickly a company can adjust market rents. Barriers to supply can depend on land availability, zoning requirements and construction cycles. These differentiating factors may lead some property sectors to perform better than others at times, depending on the economic and property cycle and a sector’s relative valuation. The Rental Index offers a slightly higher dividend yield than the Broad Market Index. The trade-off is that due to this additional income, rental-only securities tend to be more sensitive than developers to changes in interest rates. The indexes differ somewhat in other portfolio characteristics as well. For example, projected cash flow growth is currently higher for the Rental Index, reflecting several years of low commercial development in a number of markets, particularly in Asia, which has resulted in a scarcity of quality real estate in those markets. This has driven up market rents as potential tenants compete over limited available space. That scarcity may present an opportunity for future growth for developers, which would benefit the broad universe. From a valuation perspective, the Rental Index currently trades at higher premiums to NAV and expected future cash flows, as measured by our dividend discount model. At June 30, 2016. Source: Bloomberg, FactSet and Cohen & Steers. Total returns for the Rental Index have outpaced the Broad Market Index in recent years. 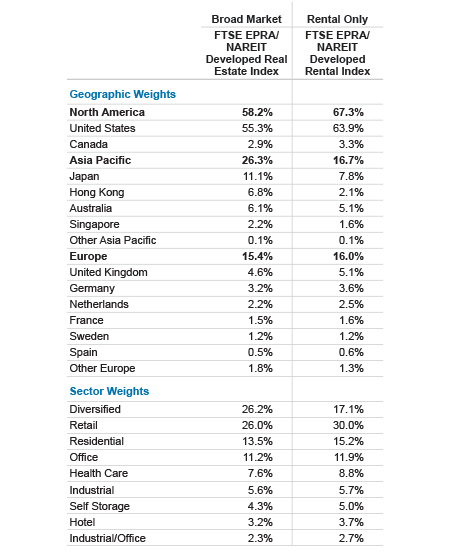 We believe the Rental Index’s outperformance was not primarily due to the exclusion of developers, however, but rather the geographic weights of the indexes. The Rental Index benefited from the better relative performance of stocks in the U.S. market (which have a greater weighting in the index), and the relative weakness of stocks in Asia (which have less representation in the rental benchmark compared with the Broad Market Index). This is just one slice of time, however, and does not necessarily reflect the indexes’ long-term return potential. Over the long term, we anticipate that the Rental Index will generally be less volatile due to the predictable cash flows landlords produce. By contrast, while the broad real estate market may be more volatile at times, it also represents a larger opportunity set that we believe holds the potential for higher total returns, giving active managers more levers to pull to generate added value. Data quoted represents past performance, which is no guarantee of future results. Returns for periods greater than one year are annualized. Standard deviation is a commonly used statistical measure of volatility, representing the dispersion of returns from the mean. Returns for the benchmarks are net of withholding taxes and in U.S. dollars. See index definitions and additional disclosures below. We believe real estate securities can serve as an effective complement to private real estate investments, enhancing an overall real estate portfolio. REITs can offer investors easy access to real estate ownership, while addressing some of the challenges that arise from direct investment. For instance, in order to establish a truly diversified global portfolio, an investor in the private market would need to commit significant capital, whereas a diversified investment in listed real estate can be made with a considerably smaller outlay. Also, private funds typically invest in a handful of properties. A portfolio of real estate securities may represent ownership in thousands of properties around the world. Additionally, listed real estate typically enjoys lower borrowing costs compared to private investors/funds, potentially allowing listed real estate to generate higher total returns for their shareholders. Listed real estate also generally offers a higher degree of liquidity, allowing investors to better manage their cash needs while providing a greater ability to make tactical allocations when needed. This is especially true for rental companies that have a strong income focus. U.S. REITs, for instance, have been quite successful over the years in opportunistically raising capital to fund their growth. In recent years, companies in Europe with comparable models, particularly in the U.K. and Belgium, have enjoyed similar success. The increased geographic and asset diversification of listed real estate can help an investor reduce risk regionally and at the property level. Additionally, listed REITs frequently own prime assets that are harder to access through the private market. For instance, publicly traded REITs control approximately 90% of U.S. Class A regional malls, which continue to thrive even as lower-tier malls struggle with competition from e-commerce retailing. The global listed market also generally has greater access to alternative subsectors, such as data storage, student housing and health care REITs, as well as access to companies and management teams where scale and platforms matter, such as in retail real estate, logistics and self storage. Whether investors choose to allocate to the rental-only segment or the broad property market, we believe there is potential for continued attractive returns in real estate in the coming years. We expect modest global economic growth will continue to generate demand for commercial real estate without incentivizing the creation of significant new supply. This should lead to rising occupancy rates and rents, providing investors with the potential for attractive, stable income and capital appreciation. A low-interest-rate environment, which we expect to continue, is also an attractive driver of real estate investments. Cohen & Steers is among the largest investors in listed real estate globally, with an expansive team of portfolio managers, analysts and traders. With 30 years of experience as a REIT specialist, our disciplined, research-driven investment process and deep understanding of global property markets has capitalized on many market cycles. We help clients access unique opportunities in the listed real estate market with global and region-specific strategies focused on both the broad market and rental-only segment. Index Definitions. The FTSE EPRA/NAREIT Developed Real Estate Index is an unmanaged market-weighted total return index which consists of many companies from developed markets that derive more than half of their revenue from property-related activities. The FTSE EPRA/NAREIT Developed Rental Index is an unmanaged market-capitalization-weighted total-return index, which consists of publicly traded equity REITs and listed property companies from developed markets that derive more than 70% of their total revenue from rental revenue from investment properties. The MSCI World Index is a free-float-adjusted index that measures performance of large- and mid-capitalization companies representing developed market countries. Important Disclosures. Performance data quoted represents past performance, which is no guarantee of future results. The information discussed herein does not reflect the performance of any fund or other account managed or serviced by Cohen & Steers, and there is no guarantee that investors will experience the type of performance discussed herein. There is no guarantee that any historical trend illustrated in this brochure will be repeated in the future, and there is no way to predict precisely when such a trend will begin. There is no guarantee that a market forecast made in this brochure will be realized. The views and opinions in the preceding commentary are as of the date of publication and are subject to change without notice. This material is provided for informational purposes only and reflects the views of Cohen & Steers, Inc. and sources believed by us to be reliable as of the date hereof. No representation or warranty is made concerning the accuracy of any data compiled herein. This material should not be relied upon as investment advice, does not constitute a recommendation to buy or sell a security, commodity interest, other investment or any financial product or service sponsored by Cohen & Steers, Inc. and is not intended to predict or depict performance of any investment.